Three Lamps is a brand new bar and restaurant in the heart of Swansea. A full refurbishment has taken place over the past year and the owner and team have created a spectacular venue unlike anything else in the city. Spread over 3 floors, the Three Lamps consists of a traditional bar and restaurant on the ground floor, a micro brewery and live music bar on the second floor and a roof top terrace bar on the third floor. This incredible venue needed an incredible website and One Time Creative was delighted to be chosen to complete the job. The main task was to ensure the website catered for multiple audiences that would be visiting the establishment. It was vitally important that the homepage would be attractive for a family looking for a restaurant, as it would be for a group of friends looking for a night out. On top of this we also had audience groups including city shoppers wanting a coffee, students looking for live music and party groups of all ages wanting to book different bar locations. The homepage was designed to use images that would be attractive for the main audience groups and multiple button options to lead people off to the areas of interest. A header menu bar was created with simple options of Food, Drink and Music, with sub-menus under each heading. All of this combined ensures visitors quickly and easily obtain the information they need, while also getting a good feel of what the Three Lamps offers. Further pages will soon be added to the website including an interesting write-up on the history of the building, which was regularly visited by writer and poet Dylan Thomas and then later bombed during the second world war. We are delighted with the end result for this website and look forward to working with the Three Lamps over the coming months and years to promote this incredible venue. W&H is a family run company based in Austria, that has been in operation for over 125 years. They are a leading manufacturer of dental instruments and equipment and known for their quality and innovation. Well established in the human dentistry market in the UK, W&H are now looking to expand in to the veterinary marketplace and so required a new website and brochure to launch the brand. Working with existing brand guidelines, that were tweaked for veterinary customers, we created a new website to promote the products available and the services W&H provide. Each product page links to product brochures and promotional videos, where available and includes testimonials from existing veterinary clients. A blogging page has been added for latest news and offers to be posted and a contact sign up form is added on several pages, to encourage new customers to obtain news and information direct to their inboxes. A product brochure will be launched in early 2019 using a similar design style to the website and helping enforce the W&H brand within the veterinary sector. Wildlife & Welfare is a new charity with a team of experienced professionals coming together for a single aim: to support charitable organisations around the world, to help them achieve more. By providing free resources and access to a volunteer network that can help with anything from marketing and fundraising, to animal welfare standards and the latest conservation methods, Wildlife & Welfare is a new lifeline in the charity sector. One Time Creative was delighted to offer it’s support to this new organisation by providing a complimentary design service for a logo and website. Stage one was to research existing charity logos and understand from the Wildlife & Welfare team, their ideas behind the charity brand and image. It was important to not focus on a specific area of the charities work, so equal weighting should be applied to both domestic animals and wildlife. Brand colours were also very important to help distinguish from other charities, while also ensuring they are bold when being advertised and when promoted on clothing by staff and volunteers on projects. After reviewing a range of logo designs and colours, a clear favourite emerged that ticked all the boxes. The next stage was the website. As with all websites, it is important to identify who the audience is. With Wildlife & Welfare, it was clear the website had to cater for many different audiences from the traditional charity supporter to employees of charities looking for resources to help them. The homepage therefore had to easily point people to the different areas of interest and still explain who the charity was for new visitors. The website also had to include a resource library with a search facility and a payment gateway to be linked up, allowing for online single and monthly donations. We are really pleased with the finished website and excited to be updating it with new content over the coming months, including an online shop and gallery page with images from the charity projects all over the world. Continuing on from the corporate brochure and product data sheets already designed for the manufacturing company Stellex, we have now completed a website overhaul, providing new content and an update to the existing design. Our work included the addition of 36 product pages and 14 case study pages. Visitors to the site can now easily see the full range of products available and can read/view amazing examples on how these products have been used in places from Chatsworth House, to the University of Glasgow. We have just completed our 27th data sheet for the manufacturing company Stellex. 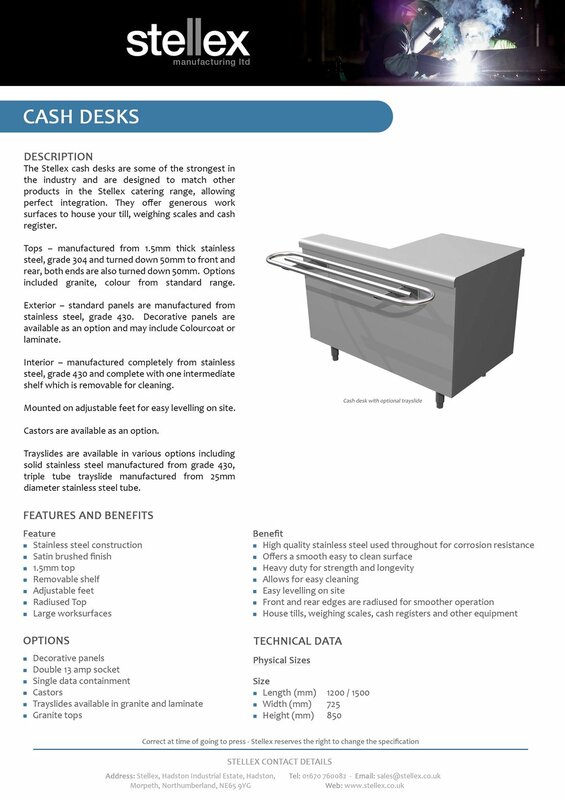 Following on from the brochure that we recently designed, we moved on to a series of data sheets that can be used by the Stellex Sales Team when talking to potential customers. The challenge was to find a design that would enable the reader to quickly find the content they were looking for and to include answers to the likely questions they would be asked. Product data was therefore split in to features and benefits, with a separate technical data section. Each product also contains information on possible optional extras to help with the sales process. The data sheets will be printed as individual pages and presented in an A4 folder. This approach makes it easy to update specific product sheets and also add new products as the company expands. We have been working with the talented team at Stellex Manufacturing Ltd, to showcase their incredible work and are proud to share their new brochure. 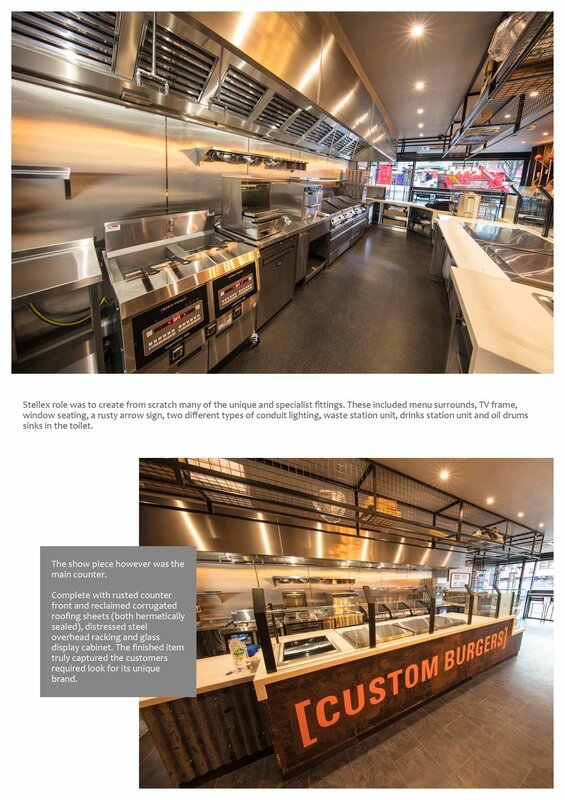 The brochure, designed by One Time Creative, provides image focused case studies of some of their bespoke fabrication projects. 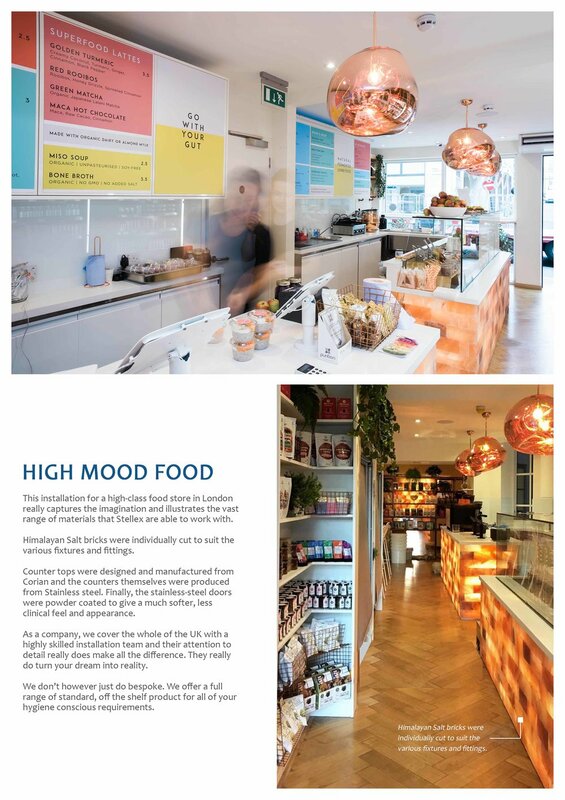 From self serve catering counters at Chatsworth House, to shop fittings and fixtures made out of Himalayan Rock Salt in the London food store 'High Mood Food', the brochure highlights the vast range of options available to potential clients. Although designed as a physical brochure to be printed, we have also made it in to a digital flip book, which you can view by clicking on the button below.